248 U.S. 215. The case involved the Hearst-owned International News Service, which had been barred from the front in World War 1 for what was perceived as unduly sympathetic reporting on the enemy. However, INS continued providing its news to west coast papers by reading stories from east papers served by the rival Associated Press and wiring their own rewritten stories cross-country. Although the war was over by December 1918, the broader implications of the legal claims lingered, and the Supreme Court held that copying of news stories was unfair competition even if there was no copyright infringement (since the stories were all fresh rewrites and only the facts were being copied). Justices Holmes and Brandeis both dissented. The story of this case has been told before, most notably by Douglas Baird in his contribution to Intellectual Property Stories. 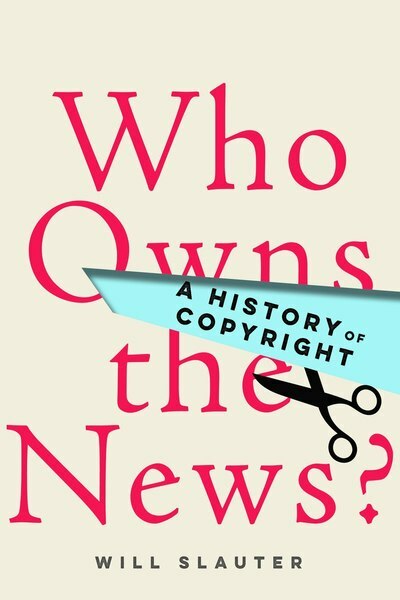 However, what I believe will become the new standard history of this case, and of the many issues of legal protections for news more generally, is an upcoming book by Will Slauter, entitled “Who Owns the News,” coming out next month from Stanford University Press. I’ve copied the description of the book below, and I believe it will be mandatory reading for anyone who would be so moved to check out this blog. You can’t copyright facts, but is news a category unto itself? Without legal protection for the “ownership” of news, what incentive does a news organization have to invest in producing quality journalism that serves the public good? This book explores the intertwined histories of journalism and copyright law in the United States and Great Britain, revealing how shifts in technology, government policy, and publishing strategy have shaped the media landscape. Publishers have long sought to treat news as exclusive to protect their investments against copying or “free riding.” But over the centuries, arguments about the vital role of newspapers and the need for information to circulate have made it difficult to defend property rights in news. Beginning with the earliest printed news publications and ending with the Internet, Will Slauter traces these countervailing trends, offering a fresh perspective on debates about copyright and efforts to control the flow of news. As part of his research for his book, Will located the transcript of the oral argument before the U.S. Supreme Court a hundred years ago in the archives of the Associated Press. He’s graciously allowed me to share the transcript here, part of my project of locating pre-1955 transcripts of U.S. Supreme Court oral arguments. It’s fascinating to see the argument, which is very different from the style today – the advocates speak much more – and the justices ask many fewer questions. As far as I’m aware, almost no-one has been aware of the existence of this document, and it almost certainly hasn’t been shared before. Enjoy! Weird. I wonder what kind of copyright they were claiming. designs applied to articles of furniture. With knowledge of the case in hand, I was able to get the case file from the National Archives. It’s fairly short at 20 pages, and the interesting parts are the complaint and answer – and especially the copy of the letter denying the copyright registration. In short, the Copyright Office held that a design for furniture was not copyrightable. For this interested, I believe this is the Thomasville Allegro Desk that was among the eight Thomasville sought to register for copyright. After the answer was filed Thomasville voluntarily dismissed the case, so no adjudication was ever made by the court. In recent years there’s been a drift away from this position, as this article from INTA exemplifies. The Star Athletica decision has been taken as further evidence of a shift to allowing copyright to protect design. I try to avoid saying which approach is correct here, but I do think the progression of the law is interesting. One interesting wrinkle – the copyright notice Brian found says 1959, but the denied registration and appeal were in 1968 – is it possible that in 1959 they applied a copyright notice but hadn’t filed the registration application, and the furniture in this photo wasn’t strictly related to the 1968 action? This coming term, the Supreme Court will hear Fourth Estate Public Benefit Corp. v. Wall-Street.com, regarding whether a party has standing to sue upon application for copyright, or whether a party must wait for the Copyright Office to register (or reject) their application. The Supreme Court only occasionally wades into this realm of technical copyright registration issues, and one of the last times the Supreme Court did so in earnest was in the 1939 case of Washingtonian Publishing Co. v. Pearson et al, where a divided court held that a 13 month delay between publication and registration did not invalidate the copyright in the work. Although the issue is not the same in Fourth Estate, the issues are sufficiently adjacent (and issues of this ilk come before the Court so rarely), it’s unsurprising that Washingtonian v. Pearson is among the most-cited cases in Petitioner’s brief that was filed last month. While serving as Abraham L. Kaminstein Scholar in Residence at the Copyright Office two years ago, I noticed that the Office has a bound volume of documents from the Washingtonian case, and that the transcript of record from the case available on microfilm and online from Gale includes fewer documents. I’ve uploaded what I’m calling a “complete” casefile for Washingtonian v. Pearson, including documents from subsequent proceedings in the case after the Supreme Court remanded it. Several years later the D.C. Circuit Court of Appeals upheld the damages award of the District Court in the amount of $15.46 (plus a worthless judgment against a bankrupt publisher), a number Washingtonian Publishing was none too pleased with, marking an anticlimax to the case. As well as these documents, I’ve uploaded the testimony from the case following remand, which is to me the most interesting thing I found. It includes the testimony of Drew Pearson, the defendant in this case, and longtime author of the “Washington Merry-go-Round” column. From the testimony the broader context of the case becomes more clear – the Washingtonian magazine was owned by the still-famous Mayflower Hotel, which in 1931 declared bankruptcy. This is why the issues of Washingtonian in question were not registered – they apparently kept publishing, but no funds were available to cover the registrations. The shadow of the Depression hangs over this case – the corporate defendant Liveright Publishing filed for bankruptcy as well during this time. It is doubtful that the litigation costs were terribly welcome by any of the parties to this case. Finally, I’ve uploaded a selection of pleadings from the case that I don’t believe made their way into the transcript of record. These include a motion to dismiss the case, a motion to strike parts of the defendant’s answer (those focusing on ownership of copyright, or lack thereof), and a motion for rehearing by the plaintiff. Unlike the previous documents these do share parts of the argument over the issue of copyright formalities, but I don’t know if they actually add new information about the case and its reasoning/argument. I had hoped to find a transcript of the oral argument from this case to add to my collection, but no such document was in the archives. It might still exist, but I don’t know where it would be in this case. One interesting thing about case reporters is that even though the text of reported cases themselves been denied copyright protection by the courts, going all the way back to 1834 in Wheaton v. Peters, case reports have been consistently registered for copyright. In the latter part of the 1980s, Mead (the service now known as Lexis) introduced star pagination, allowing a reader to identify when a new page began in the printed reporter, which was published by West. 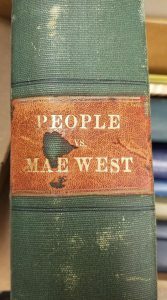 West Publishing sued, and in 1986 the 8th Circuit held that West had shown a likelihood of success that the Mead star pagination feature infringed their copyrights in page numbers, in other words the selection and arrangement of the case text. In 1988 the parties settled, but concerns lingered about the applicability of copyright to law reporters and other legal compilations. This was amplified by the 1991 Supreme Court decision in Feist v. Rural Telephone, which cast the holding of the 8th Circuit in the Mead case into some doubt. In Congress a bill was introduced to make clear that page numbers in legal compilations could not be protected by copyright. Thus a Congressional hearing was held on May 14th, 1992, before a subcommittee of the House Judiciary Committee, to discuss the issue of whether copyright should protect such things as page numbers. The text of this hearing has long been available, but I think it’s much more interesting on video, and in some cases it illuminates the content of the hearing as well. I’ve included the video below.